This is a higher end option that is classier and will last longer than the typical universal seat covers. 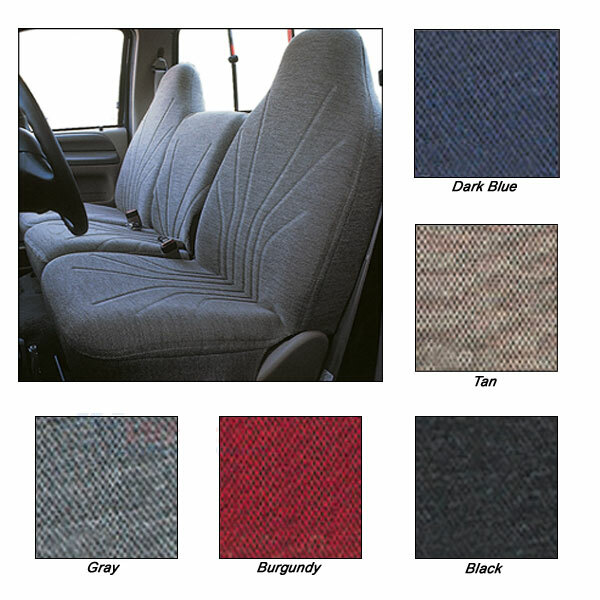 These woven tweed acrylic seat covers can complement any interior with five great color options (blue, tan, black, burgundy and gray). The fabric is stretchable so it slips over standard factory pickup and SUV seats for an almost-custom-made look that completely covers the sides, front and back of the car seats. The covers are sewn and stitched to look and fit better than universal, off-the-shelf covers and the stitching should hold up over time. The seats install easily with self-attaching straps and the woven tweed fabric is machine washable and easy to care for. Remember to make sure that you are not covering airbag deployment mechanisms.